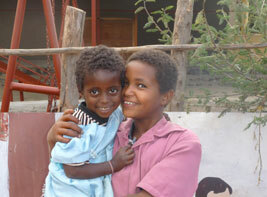 We Angie and Mike King have been travelling to Ethiopia for the past 11 years. This is our 10th newsletter detailing our trip of 2014. Our activities are a mere drop in the ocean, but where that drop lands, it gives great pleasure and hope. That drop then creates a ripple and that ripple will help to change lives. We are always a little apprehensive when we first arrive in Bahir Dar, waiting for our baggage to arrive on the dilapidated carousel, we think about how the projects from last year are going, how the many people we have helped over the years will be and how the wonderful children at the Day Care Centre will be. We did not envisage however that there would be no one to meet us at the airport. Sister Terfatu was in Addis Ababa having a long awaited eye operation, a break down in communications with Sister Ayelech who was told that we would be arriving on the evening flight and not on the mid day flight meant that we were stranded along with 160 kilos of baggage. Not to worry after a bit of haggling a local taxi driver agreed to take us to the Sister’s home in a car with more holes than car and with most of our luggage hanging out the back of his boot. Needless to say we arrived safely much to the surprise of everyone who thought we would not be there until late evening. It gets tougher each year as when we arrive more people come to ask for help, helping the very poor to become self sufficient is always our aim but some times a hand out or ’hand up’ is essential. This year we had some very difficult conversations with families whom we had helped in the past but were expecting more help this year. We had to make them realize that they have to try to fend for themselves we will always offer support in setting up a venture or for medical treatment but being self supporting is our goal.